Heroes Of The Home Front. In a nondescript brick-building at 213-217 N. 4th street , a military operation is being undertaken that is aimed at winning the battle against homelessness, Post-Traumatic Stress Disorder and other ills that are besetting returning Veterans. Looking at returning veterans from 2009-2011, the U.S. Department of Veterans Affairs recently revealed an alarming increase in suicides: a jump of 44 percent among men and an 11 percent rise among women. 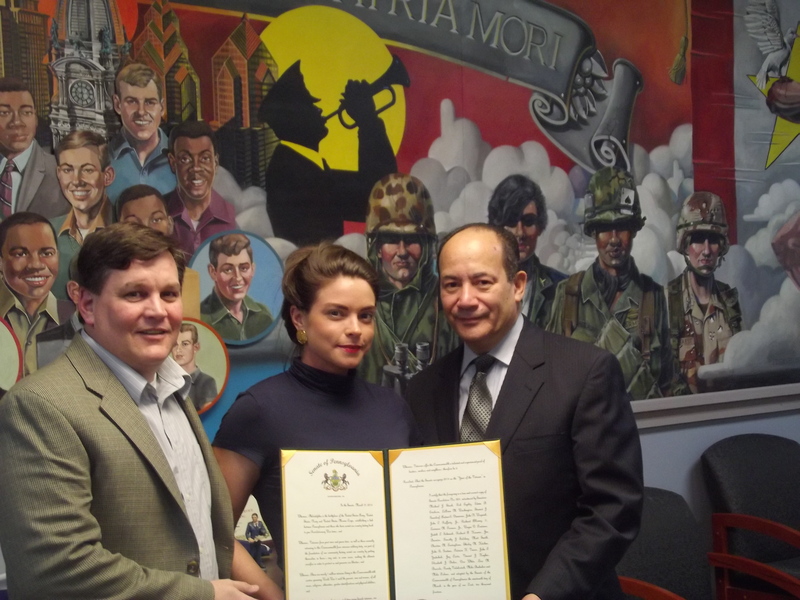 Under Executive Director Timothy Meserve, a former Lieutenant Colonel in the Air Force, the Veterans Multi-Service Center (VMC) – on a daily basis – serves more than one hundred of Philadelphia’s and Southern New Jersey’s 88,000 Veterans. With a staff of ninety -mostly comprised of Vets – the VMC provides a myriad of services to Veterans, including job training, computer training, benefits counseling, transitional and permanent housing, financial counseling and assistance, and job placement through an in-house Career-Link. Besides running a Thrift Shop in the city’s Frankford section that employs a number of Veterans, the Multi-Service Center also offers a shuttle service to the local VA Medical Center, a laundry, and free breakfasts and lunches. Among the latest additions to the VMC, is a Women’s Center, which serves the growing population of women veterans; and a Microsoft Certified Computer Training program. For Juvencio Gonzalez, a U.S. Marine Corps Veteran from the Vietnam era who found himself forced out of a job as Assistant Director of Community Relations at a local University due to what was termed restructuring, the Veterans Multi-Service Center was pivotal to getting him back to financial solvency. “If it wasn’t for the Vets Center, I probably would have been homeless,” says Mr. Gonzalez. After having nearly exhausted all of his resources in a legal fight over his removal, Mr. Gonzalez said he was urged by another Vietnam Veteran to look into the VMC. As part of a nationwide effort to end homelessness, Mr. Meserve along with Director of Development Debby Derricks, and their job placement specialists, the VMC in 2013 was able to place more than 300 Veterans in jobs. Although they are again achieving 100 percent of their targeted goals, Mr. Meserve noted that budget cuts have limited their job placement efforts to 120 jobs this year. “What we’re really doing is ending chronic homelessness of Veterans and getting to those Veterans who have been on the street a long time,” said the former Lt. Colonel. Of the “complicated” causes contributing to homelessness among Veterans, Mr. Meserve says “addictions” and high or low levels of mental illness – often stemming from military service- are principal factors. While they’ve had support from the city, particularly Council Oh and at the state level from people like State Sen. Mike Stack, Ms. Derricks noted a decrease in federal funds has forced them to become more “creative.” So on May 4th, there is a golf outing to raise funds; and on May 10th, a 5K Run and Walk called “Bridge to Opportunity” will begin at 4th & Florist, to help Local Vets. The VMC also accepts donations of furnishings: tables, chairs, dressers, etc. Introducing Democratic Candidates for Governor. Disregarding Will’s cynicism, more than 300 Philadelphia Democrats filled S. Broad street’s Gershwin Auditorium, Sunday, to hear four of the five Democratic Gubernatorial candidates square off in a nearly two hour debate. Discussing a wide range of issues that included education funding, health care, the environment and corporate tax loopholes, the foursome of Allyson Schwartz, Jack Wagner, Rob McCord and Kate McGinty were decidedly in accord on nearly every issue, but each gave the audience a non-televised glimpse into their backgrounds, personalities and persuasive abilities two months ahead of the May 20th primary. “This is a Governor whose Attorney General fought tooth and nail to stop the availability of health care coverage. He’s not changed his stripes,” continued McGinty, 50, a Northeast Philadelphia native who graduated from St. Joseph’s University with a degree in Chemistry and later earned a law degree from Columbia University. 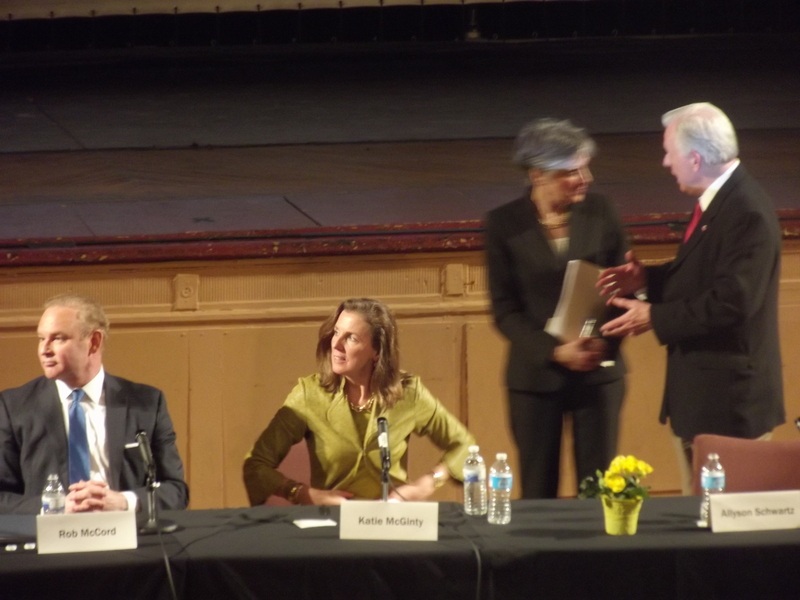 Using colorful jibes throughout the forum, McGinty recalled Gov. Corbett’s having “crocodile tears over the CHIP program, when he presided over nearly 8,000 young kids” being removed from the program. U.S. Rep. Allyson Schwartz, a Bryn Mawr graduate similarly denounced Corbett’s decision not to expand Medicaid and to “have rejected our taxpayer dollars that would have come home to cover 500,000” residents under the Affordable Care Act. Pennsylvania State Treasurer Rob McCord described the Corbett proposal as both “immoral and inefficient,” a phrase he repeated for emphasis. After reiterating that the Governor had rejected “your taxpayer dollars” that would have covered 500,000 residents, McCord also referred to the administration pulling back on a provision for “disproportionate care.” McCord noted that this funding supports “health care providers” in areas like Southeastern Pennsylvania and Philadelphia, where “less affluent people” fill emergency rooms needing care. Wondering whether Corbett is “just misinformed,” McCord drew sustained applause when he argued that, “Medicaid is more efficient, not less efficient” than Governor’s “short-term, profit-maximizing” solutions. “These types of cuts have been going on” since Gov. Ridge,” said Allyson Schwartz. The issue of funds for public housing drifted into a critique of Gov. Corbett’s failure to adequately tax Marcellus Shale drilling. Calling for a 5% extraction tax on Shale oil, Rep. Allyson Schwartz said the next governor could use the added funds to “support affordable” public housing. “It’s unbelievable that states as conservative as Texas, Oklahoma and Alaska, have a revenue source and are using it” for various purposes. Mr. McCord urged “robust environmental protection” policies, which he says begins with a ten percent extraction tax on Marcellus Shale drilling. That’s never the case “when it comes to a natural resource,” said McCord. There was unanimity also on the need to eliminate the Delaware loophole which enables local companies to avoid taxes. “The very conservative (Corbett) administration and the General Assembly won’t touch that issue,” said Mr. Wagner. “But it needs to be addressed and there is significant savings,” if it’s eliminated. All four candidates were in agreement on more stringent monitoring and “transparency” in regards to funding Charter/Cyber schools. And citing their immigrant family backgrounds, they unanimously backed passage of the state’s Dream Act. Disappointed in that the current leading candidate opted out of the forum, Melissa Robins of Media M. P. said she liked the “passion” of Rob McCord. Pleased with her strong statements on behalf of “women’s health care and economic security,” Doris Thomas said she was voting for Rep. Allyson Schwartz. Although they can’t vote, a pair of high school students, T. Santiago and B. Morales distributed McGinty signs outside the Gershwin Hall. Both said they identified with her: “She’s like us, she comes from a big lower-middle class family and she made it. And she wants to help students.” Ms. McGinty is the daughter of a retired Philadelphia Police officer and has nine brothers and sisters. Candidate Tom Wolf was attending a previously scheduled event in Pittsburgh.